Until the end of the 17th century, coffee was grown exclusively in its native Ethiopia and in Yemen, as it was considered illegal to carry a green coffee bean out of Arabia. In 1670, a Sufi named Baba Budan (now considered a saint by both Hindus and Muslims) smuggled seven coffee seeds out of Yemen and into India by strapping them to his chest, and the seeds were planted in Mysore. 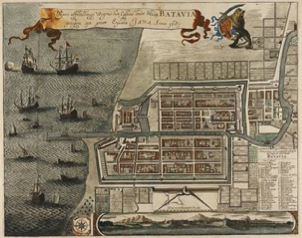 In 1696, the Dutch governor of Malabar (an Indian colony) sent a coffee seedling descended from Baba Budan's green beans to the Dutch governor of Batavia (now Jakarta), and by 1711 the first exports from Indonesia to Europe were sent via the Dutch East India Company. Around 1714 the Mayor of Amsterdam gave a coffee seedling to Louis XIV of France, who placed the plant in the Jardin des Plantes in Paris. Ten years later a young naval officer named Gabriel de Clieu transported several seedlings descended from that plant to Martinique. Within 15 years, there were 19 million coffee trees on Martinique, and currently, 90% of the world's Arabica plants are descended from those seedlings.